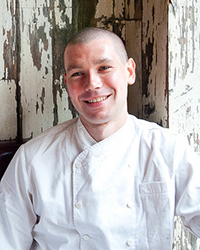 Why He's Amazing: Because from Battersby's tiny Brooklyn kitchen, he and his co-chef Walker Stern are turning out creative, market-fresh dishes that outshine those at many high-end Manhattan restaurants. Aha Moment: "At the start of 2011–end of 2010, Walker was briefly working with me at Anella. It was so different from any other restaurant we had worked in: not in Manhattan, a really small restaurant with a minimal budget. So we were like, 'We could do this. It's the direction restaurants are going in anyway.' We could have had a big restaurant in Manhattan in a long time or we could do this immediately."